Low-e coatings play an important role in the overall performance of a window and can significantly affect the overall heating, lighting and cooling costs of a home. But what exactly is low-e glass? How does it work? 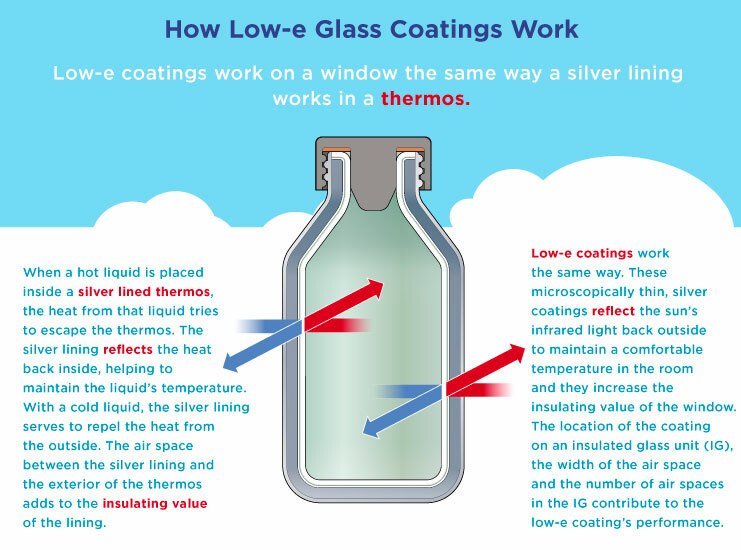 To answer these questions, the “e” in low-e glass must be explained. The “e” stands for emissivity. Emissivity is the ability of a material to radiate energy. When heat or light energy—typically from the sun or HVAC system—is absorbed by glass it is either shifted away by air movement or re-radiated by the glass surface. In general, highly reflective materials have a low emissivity, and dull darker colored materials have a high emissivity. All materials, including windows, re-radiate heat in the form of long-wave infrared energy depending on the emissivity and temperature of their surfaces. Radiant energy is one of the important ways heat transfer occurs with windows. Reducing the emissivity of one or more of the window glass surfaces improves a window’s insulating properties. Therefore, having low-e glass ultimately can improve the insulation of a home from external temperatures in any climate. To reduce the emissivity of glass, low-e coatings have been developed to minimize the amount of ultraviolet and infrared light that can pass through glass without compromising the amount of visible light that is transmitted. How Can Homeowners Tell if Their Windows Have Low-E Glass? If the window contains low-e glass, one of the images will be a different color than the rest of the images. If the window does not have low-e glass, the four reflected images will be the same color. To assist residential window manufacturers and homeowners with product selection, the Efficient Windows Collaborative has developed Window Selection Tools for New Construction and Replacement Windows. These tools provide step-by-step decision-making support for determining the most energy efficient window for a given residential building.